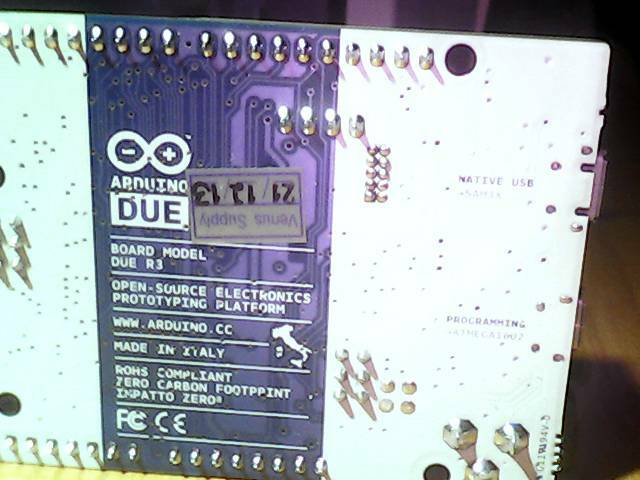 ARDUINO DUE the ferrari from piedmont, italy? my friend buy from thaieasyelec ( lucky, now out of stock ) and send me hopefully today for test / play. for DUE and MAX32 and compare the results. 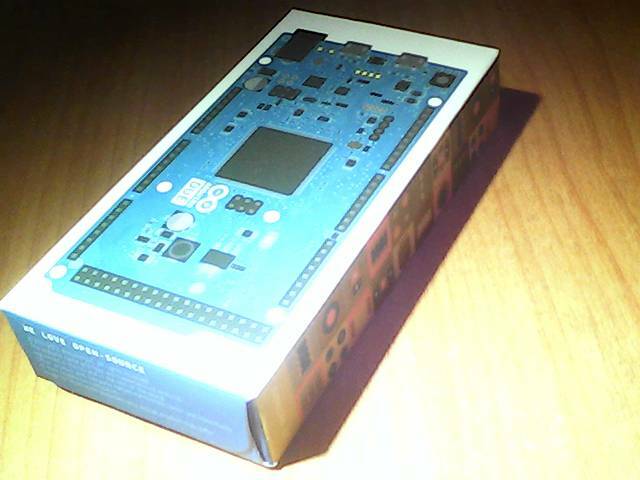 to believe its a original, but my usual supplier thaiduino say we can trust them. 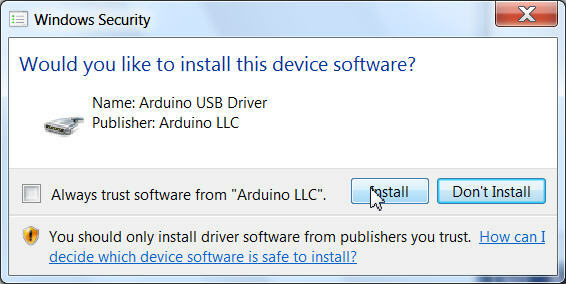 as usual in our fast changing world: i need a new arduino revision. ( where the usb connection is slowed down / not the scope batch ). __AVR__ does not work anymore for DUE and bunch of variables are not defined. 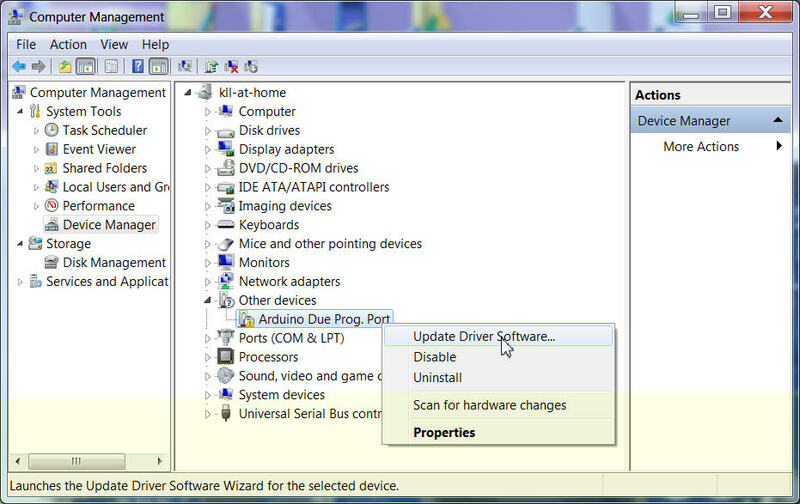 cpu info here and AD converter. also a 3v3 board, and need the voltage divider to measure the 5V range. today the THAI POST EMS was one hour late, but no problem, i was out one hour for running anyhow. 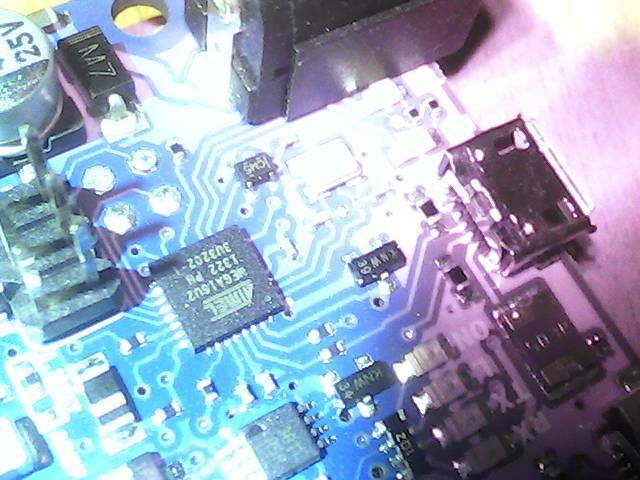 the USB connector is different from the old arduinos, its the small one, but not same as with MAX32. so actually its the same as with RPI and my LG mobile / charger cable, lucky. connect, green LED and yellow blink. 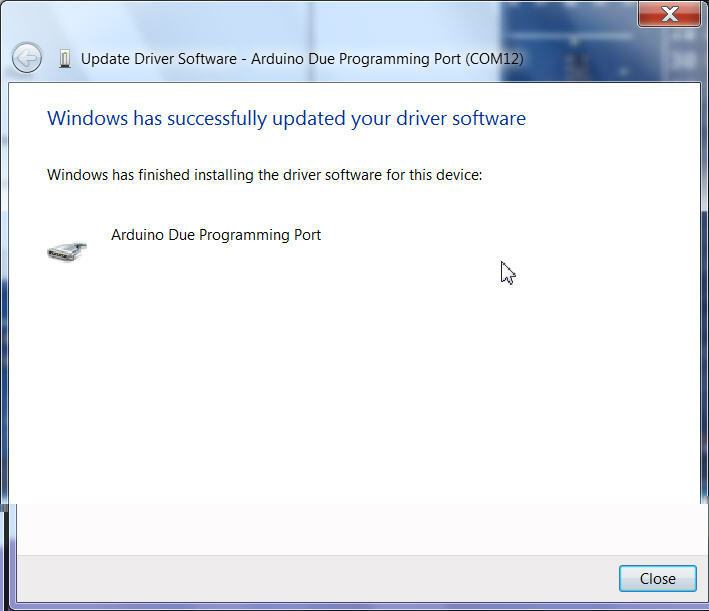 but WIN7 as usual driver installation fails. my menu program template needs update anyhow. because it is prepared for 10 semi parallel tasks, but the examples are all disabled. with diagnostic ON (menu "d" ) it prints the internal time after 1.000.000 loops. 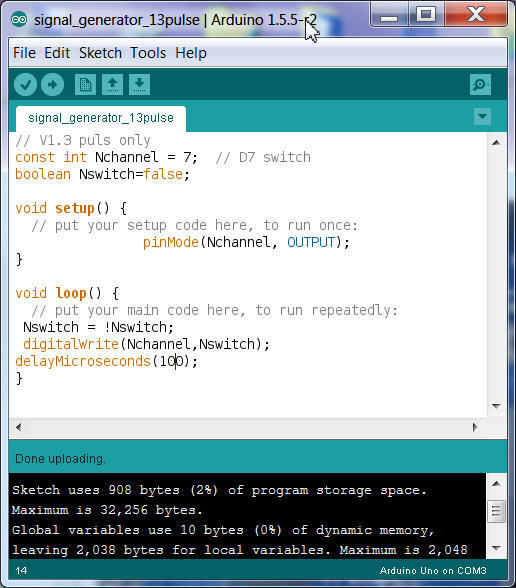 and checks if there is a operator input, using the Serial.available() function. and for both counter the IF for the limit reached. 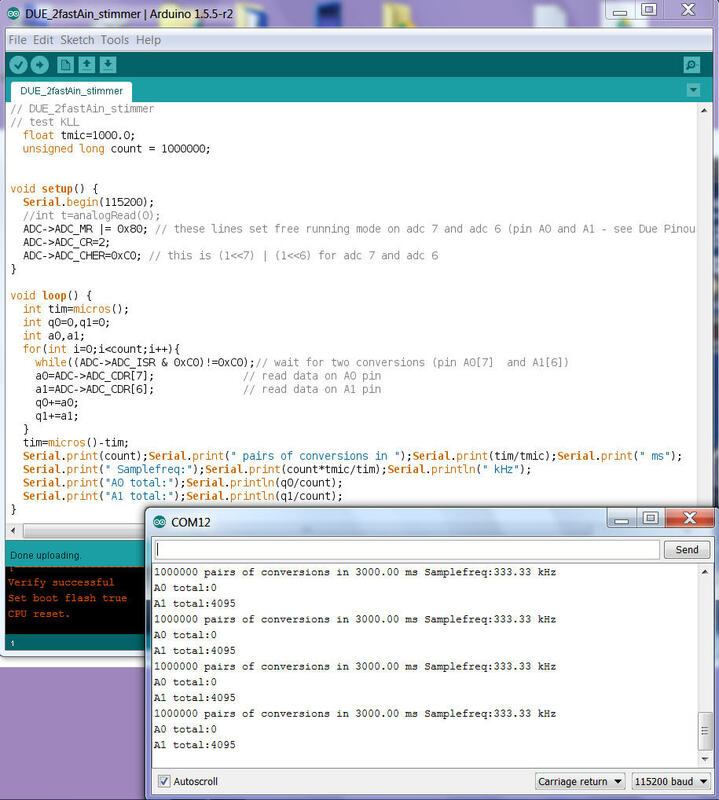 the print (F()); not known, change back, (!Serial) for leonardo and inputstring.reserve(20); not work with PIC32. that is so fast that i blame the changes here and reload that code back to the DUE for recheck. no rename, no change needed, just compile and upload and see the 6sec again. yes, i know that for benchmark must give/compare more jobs. 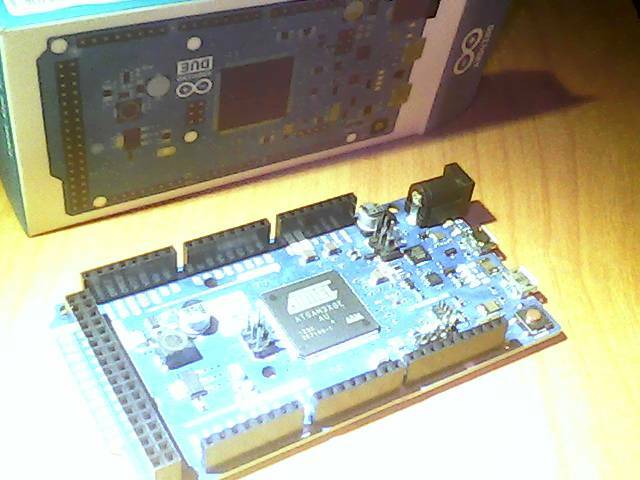 here it would be digital I/O, analog read..
compared to Arduino MEGA the DUE is 3 times faster and the PIC32 10 times! and compared to the UNO, the DUE is more a comfortable spacewagon, not a ferrari. but that's just a first impression. and pls note, that above data use the internal timer of the devices! where you could report the delta time between the (usb) events over some time. there we see that the UNO time was wrong/slow about 3min / day. b.c. the SMS came every day 3 min. later. because its not a max32 ( using a assembler code with pointer 0 ) and not a AVR using a setup for faster reading. 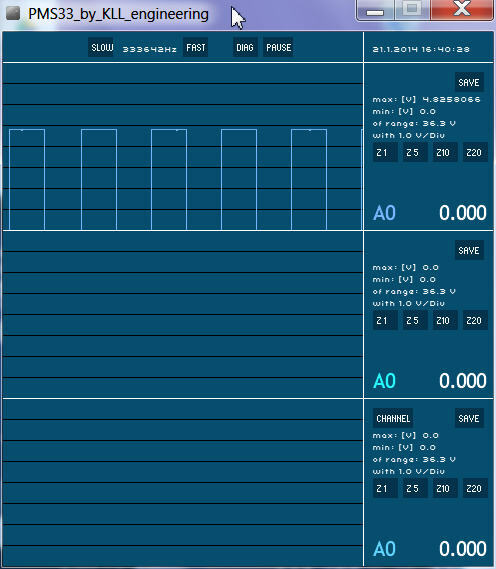 set pointer to 5 and see 10500Hz. set a jumper and get confused??? go back to the menu program and check from there, also not ok.
! i did NOT try to measure 5V! and sometimes think channels 1 and 2 are switched?? and the channels (0,1,2) do what what they are supposed to do. UPS, that was a bad one. ok 155r2mod looks good now. but possibly it was not only analog in wrong, also a timer? nope, 6 sec again. so for the default timing of scope i need to adjust the delay array. now that's not only time consuming, its also not easy to understand. but, the first 2 values are 0 delay. in the code it is getting more difficult, because a delay of small values gives errors, so the delay must be disabled. pointer 1 ( also no delay ) means you measure (with PMS3 ) 3 channel as fast as possible. 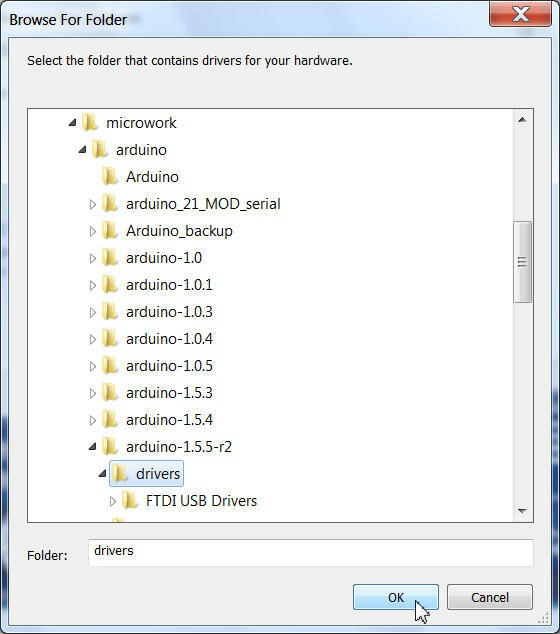 here we are so slow that we can do read Ains, write USB in conti modus. but the step size should be usable. 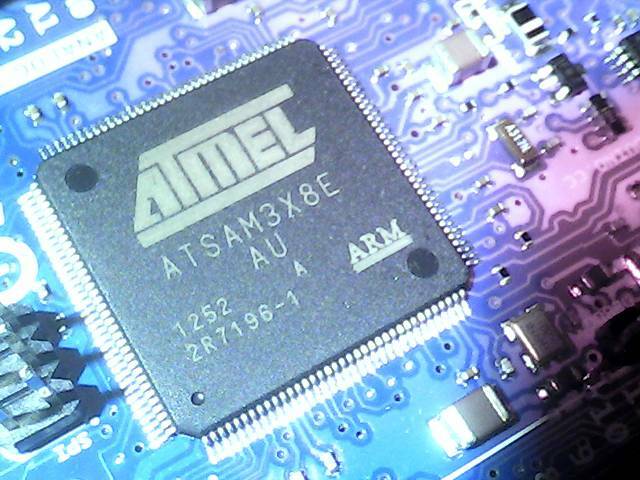 what at default had about 8kHz only, it is not too far away from the 520kHz of the PIC32 assembler routine. but i not see mentioned if that is relevant for speed ( but it should). But as we do a comparison here its not fair now switch from 10 bit like UNO..
to a 8 bit resolution, just to get impressive speed numbers. The first checks in 4um show a 1MHz sample rate is possible. 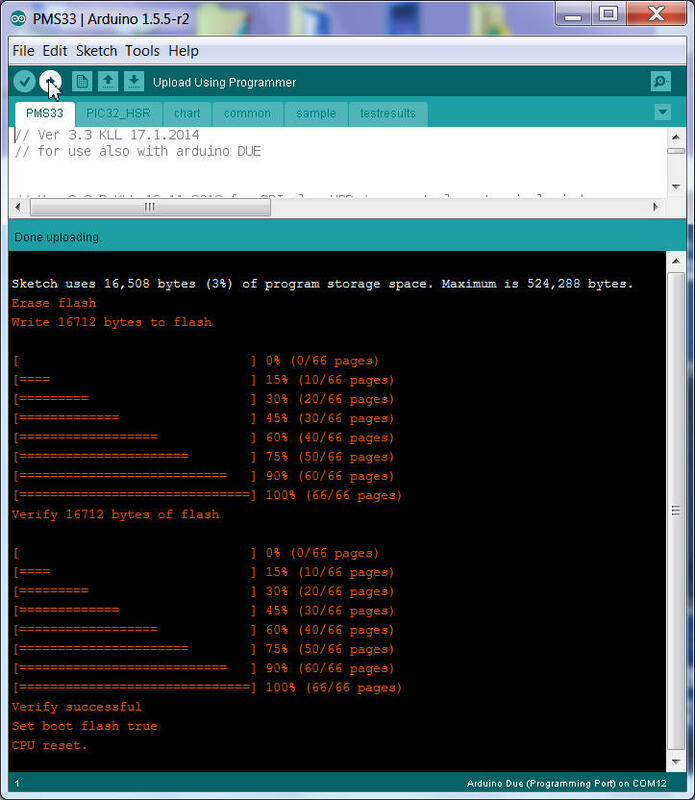 for the SAM speedup ( first for A0 only ) start with a separate program following the forum info. and build it into PMS33. 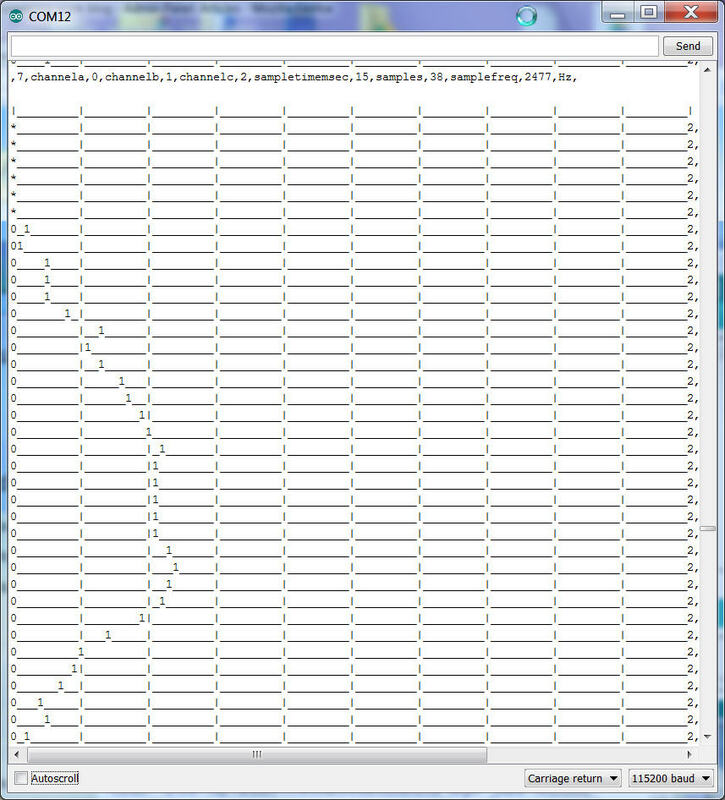 using the same variable and function names and program structure as with PIC32. but keep the #if defined(__SAM3X8E__) separated for understanding and maintenance. like for a 12bit value, but that does not say anything. 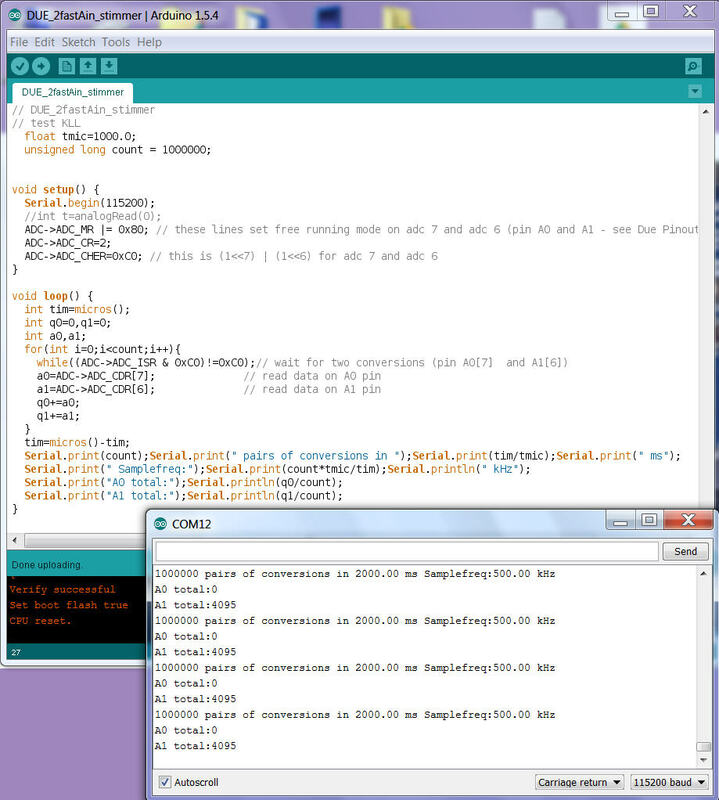 i just divide it by 4.
while with arduino 1.5.4 the speed at 1 is only 8kHz, at 0 its 1MHz ( Stimmer code works ) and i can switch back to 1 ( 3 channel) successfully. 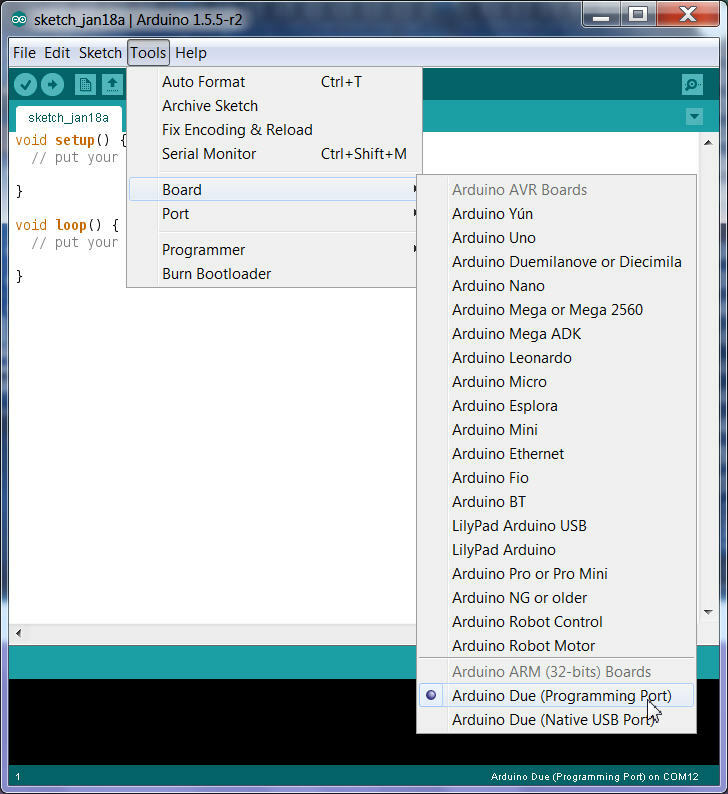 with pic i not needed to set parameters back, on DUE with STIMMER code and 1.5.5 it seems to be necessary to reinstall default settings, i have to find that code first, search "adc_init", but i don't want to make a system init. 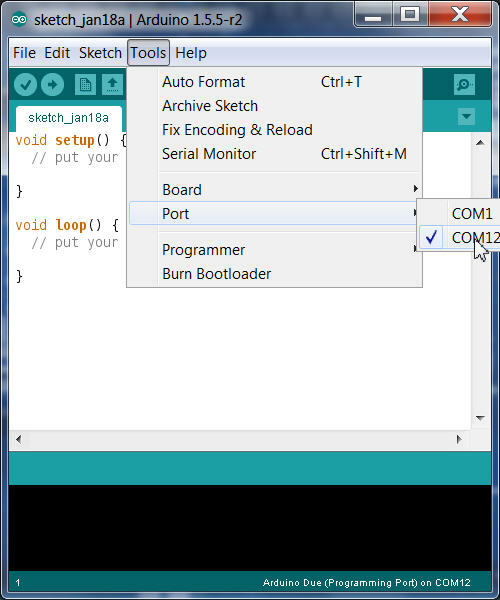 so the adc_init works, and also under arduino 1.5.5 i can switch back from 1 channel to 3 channel mode. the only issue now is that in 1 channel mode, A0, i see only 333kHz, and not 666kHz for 1.5.5 or 1MHz like for 1.5.4. 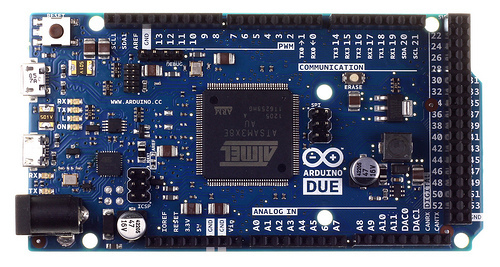 -4- connect: A0 to UNO puls, A1 to 3v3, A2 to 5V USB ( on DUE board ) ! using above voltage divider ! but a spacewagon with a porsche motor. 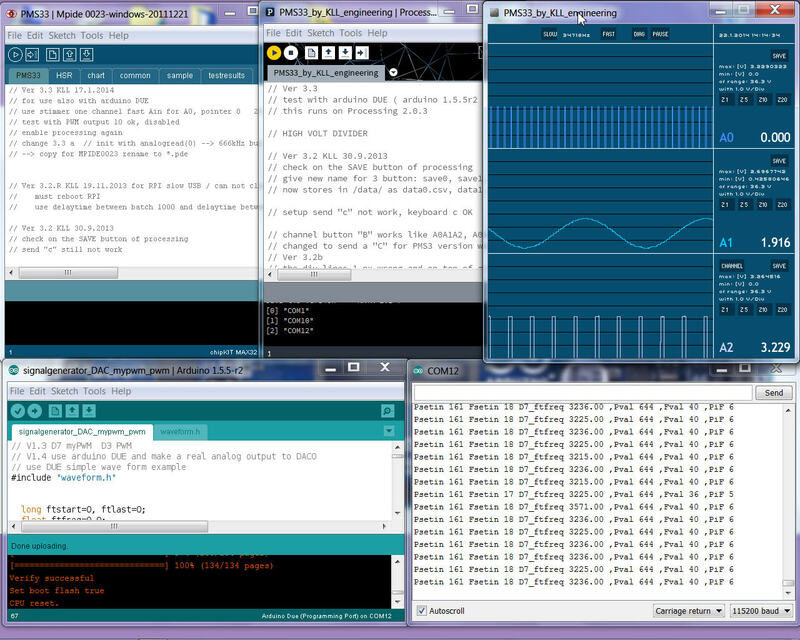 bad luck that some transmission dimensioning ( arduino 1.5.4 / 1.5.5 ) not optimal. update: i not remember what i tested yesterday, but today i used that feature from STIMMER to do a analogread(0) first and then set the ADC free running mode, because in pointer1 last read cycle was from A2, now with doing one more read from A0 the "focus" is on A0 and the fast ADC code now works with 666kHz ( under 1.5.5 ) ( without it was the 333kHz ), but i noticed now i can not switch back to slower, it hangs after the adc init??? with 1.5.4 i see >900kHz, and i can switch back to slower, ( but that is all that old 8kHz slow ) . is valid for DAC and PWM! so all output parameter match now with 4095. This can now only run on DUE!